A temporary garden of remembrance was erected by the Greater Shankill ACT initiative, in a dignified tribute to those who the group say "dedicated their lives to fighting republicanism". The Greater Shankill ACT initiative has paid tribute to the men they say “dedicated their lives to fighting republicanism”. The tribute came as they unveiled a temporary garden of remembrance at Lawnbrook Avenue in Belfast’s Shankill area. “We decided this year that we would try to deliver a very poignant act of remembrance. In the entirely unbalanced prevailing legacy narrative it appears that republicans are entitled to remember their dead, but that loyalists are meant to hide away in the corner. In response to a predictable online onslaught and criticism from pan-nationalist activists Mr Pollock highlighted the respectful nature of the tribute, saying “this was not some glorification of the brutal events of our recent conflict, but rather an opportunity for loyalism to pay tribute to those that defended our community. Loyalists corporately in 1994 expressed abject and true remorse to all innocent victims. That does not mean that we as a community are not proud of the men, and women, who dedicated their lives to fighting republicanism”. 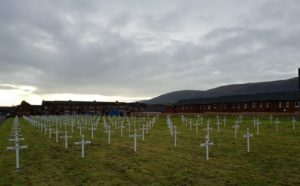 Explaining the memorial, a statement from the Greater Shankill ACT Initiative said “The garden contains hundreds of large white crosses, each carrying the name of a deceased volunteer. The memorial will remain for a short period of time; thereafter the crosses will be removed and presented to family members of the deceased. “We feel it is crucially important, as part of our commitment to positive transition, that former UVF combatants and the families of deceased volunteers are not left behind, that their memories are not tarnished as part of a carefully co-ordinated attempt to re-write history and most crucially of all that their motivation for engaging in the conflict, namely the defence of our community, is not misrepresented. The temporary memorial was visited by hundreds of people in recent days and has been widely praised.